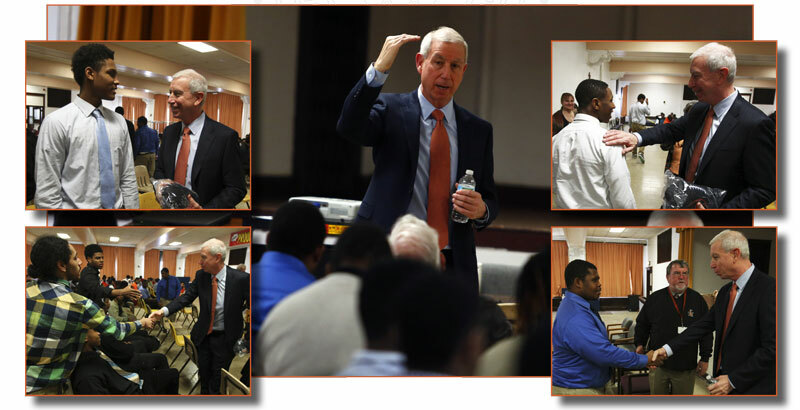 Leo welcomed a special guest to 79th Street on Friday, March 6, 2015 when Chicago Blackhawks President and CEO, John McDonough stopped by for a visit. McDonough, a longtime friend of Leo President Dan McGrath, spoke to an all-school assembly in the Leo auditorium. Citing his background as an average athlete and a below-average student, McDonough described himself as “an underdog” who achieved success through hard work, determination and a commitment to building relationships with people who could help him. McDonough worked for the Chicago Cubs for 24 years, rising to the position of team president before moving to the Blackhawks. Throughout his career, he said he has been mindful of the need to set high goals and the importance of having a plan for reaching those goals. A video highlighting the Blackhawks’ many achievements under McDonough preceded the speech. McDonough took questions from Leo’s students for a good 40 minutes after he finished, answering each of them thoughtfully and graciously. Each Leo student and teacher in attendance received a gift bag of Blackhawks souvenirs as the program concluded.